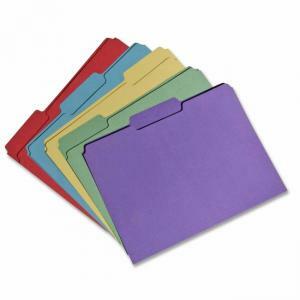 File folders are made of 100 percent recycled material with a minimum 60 percent post-consumer material. Letter-size file folders with single-ply top are made with a water-based adhesive and chlorine-free process to protect the environment from harmful chemicals. Design also features top tabs in assorted 1/3-cut positions and 11 point stock. Tabs are single-ply. Bottom is scored for 3/4" expansion.